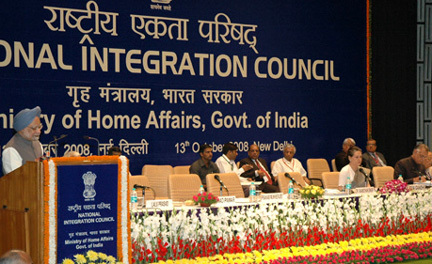 13 Oct : The 14th meeting of the National Integration Council (NIC) began this morning in New Delhi today. In his inaugural address, the Prime Minister Dr. Manmohan Singh said that the we need to meet the mindless violence with requisite amount of force but must also ensure that this is tempered by reason and justice which is the normal order of governance. The Prime Minister said, perhaps the most disturbing and dangerous aspect today is the assault on our composite culture. An atmosphere of hatred and violence is being artificially generated. There are forces deliberately encouraging such tendencies and also spawning militant outfits who engage in irrational violence. In his introductory observations, the Union Home Minister Shri Shivraj V. Patil said that the current communal and extremist situation in some part of the country has been included in the agenda to provide opportunity to the members to express their views on the issues. Shri Patil said, the decisive forces and agencies and parochialism have surfaced at many places causing damage to the properties and lives of the innocent citizens. Such tendencies and persons promoting them should be controlled and punished severely, if they do not change their attitude through persuasion and dialogue. In these efforts, the Governments at all levels are cooperating in many ways. While tackling the mischief mongers and criminals in effective way, the governments want to avoid causing any kind of damage to any citizen or any section of the society. The Home Minister said that uniting forces have proved successful till now and hoped that these would be successful in the future also. The agenda for the meeting include: Social Structure–Caste & identity divisions and rhetoric; Economic development–Equitable development and removal of regional imbalances; Promotion of feeling of security among minorities & others vulnerable sections; Education – Promotion of education among minorities, Schedule Castes & Schedule Tribes; Communal harmony; Other elements contributing to national integration; and Extremism. Headed by the Prime Minister, NIC includes Union Ministers, Chief Ministers of all States and Union Territories, which have legislatures, leaders of national political parties and of regional political parties, Chairpersons of National Commissions, eminent public figures and representatives from business, labour, media and women. Very sad a poor and weak PM is talking of unity,he himself is not above his religion, he should change his name as Manmohmaad Thomas because of his love towards both of these religions, he never think about those hindus who were killed in attacks and bomb blasts. Manmohan will be remembered as a black spot on the post of PM in the history of india. why not they ban DMK who suppports DMK and openly crticicize central govt. policies why not they use article356 against DMK. If he is honest why he is taking support of dalal Amar anshari nee singh a cheap and corrupt politician who is tout of reliance anil ambani group. Manmohan singh is not honest PM he has bribed to MPs to save his govt. just like Narashima Rao, his relatives are taking advantage of his position. He has waived loans of Panjab govt. only in billions of rupees why not of any other state who has much poor condition than panjab, this is also partisan approach and prove he is not honest. The citizens of india must get rid of this black sheep as soon as possible in the interest of intergrity of this country.